We are glad to announce the start of our new fundraising Campaign “”. We wish to raise 1000 sanitary pad packs to support underprivileged girls in Cameroon. This campaign runs from 1/08/2017 to 28/05/2018. BENEFICIARIES: Girls and women in the following institutions: Grace Of God Philanthropic Orphanage Buea, Father’s House Orphanage Muyuka, God First Orphanage Wotutu Limbe, Root For Kids Orphanage Bokova, Bulu Blind Centre , Buea School For The Blind, HOTPEC Orphanage Mile 14. 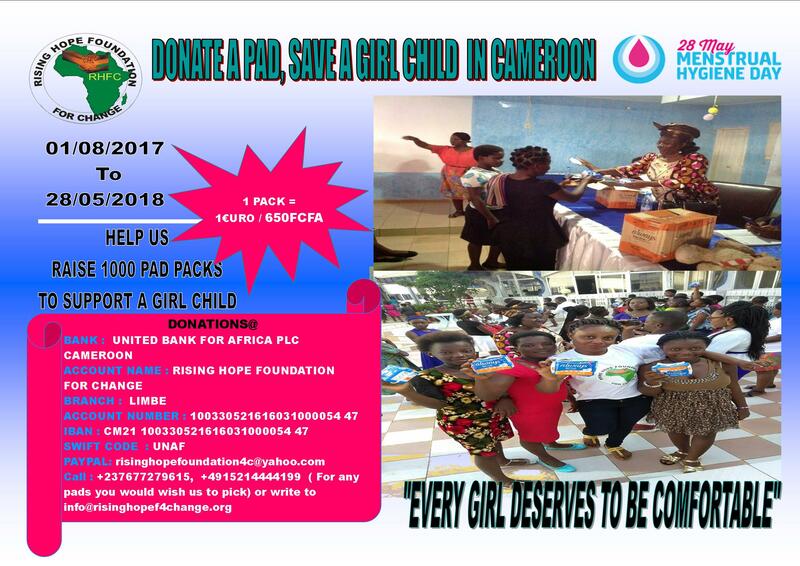 Finally, RHFC and partners will end this campaign with the celebration of the World Menstrual Hygiene Day on the 28/05/ 2018 in a Rural community in Cameroon. Sanitary products: Sanitary pads, sanitary towels, menstrual cups, tampons and other ways to secure healthy menstrual hygiene management. RHFC is seeking for partners, donors, companies and individuals for this exciting new endeavour to make a difference and the world a safer place for all…because every action is a small step towards a bigger change!